The sponsors for the Great Annual CliffCare Raffle have now been confirmed. Please support these sponsors as they support us – many of them year in and year out. Tickets for these will be sent out to members in the next two weeks. Remember – this is our main fundraiser for the year and allows us to continue much of the work we do. Many thanks to the members for your continued support and the sponsors for their great prizes. Discussions are underway to set up the Campground Host Program at Arapiles with a joint program between Parks Victoria and VCC/Friends of Arapiles. This is very similar to the campground hosts you may have seen at other campgrounds – the difference here being that the host volunteer/s will be people from our own community ie climbers and dedicated Arapiles visitors. This is a great opportunity for us to be more involved in the care of the park and campground. With ranger activity becoming less at many of the parks now, hopefully this will give visitors to the park a helping hand when it comes to many of the issues that can cause trouble down the line. We are looking at a trial period starting in December. I am looking for Expressions of Interest from those who would be interested in being a campground host for Arapiles. Training will be given as well as tent facilities, free camping etc. I would envisage that quite a few volunteer hosts would be required to share the load. Whilst planning is still in early stages and dates are not set as such, September to the June long weekend is the time frame we are thinking of –focusing on the school holidays, long weekends, Christmas and New Year break etc. I will have more information to share as we work on the program so drop me a line if you could be interested. Keep an eye on the calendar for the next working bee at Mt Arapiles. Dates are looking good towards the end of October. Walter has built the track up to the Fly by Night Gully and all the rocks we hauled up there for him to work on have now been used. Time to haul some more so he can continue his great progress. 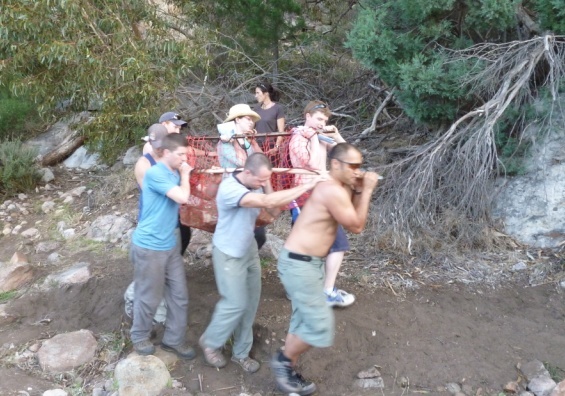 This entry was posted in Access &Environment officer reports and tagged arapiles by Tracey. Bookmark the permalink. Received the advice today about the Cliffcare Raffle sponsors which proves the blog’s automated system is working nicely. I was surprised to note that there are only 6 people subscribed to receive such updates (5 others and me!). Are you intentionally keeping the blog low key? I notice that there is no link from the VCC website. Good to hear. Think you only get them when I add something to the Homepage/blog though not the other pages.